(Dec 4, 2015) Isle, Minn. — Local homeowners, business owners and concerned anglers have joined forces in Minnesota to form a new non-profit organization: the Mille Lacs Smallmouth Alliance. Recently electing a dedicated board of directors, the organization is starting work on its mission. This non-profit (pending official 501c3 status) is dedicated to rebuilding, preserving and maintaining Mille Lacs as a world-class trophy smallmouth bass fishery. The work includes educating fishermen, local businesses and visitors to the lake about the benefits of catch and release and advocating (with conservation officials) for sound bass-management practices. The organization has set forth a premise that a healthy, trophy smallmouth bass fishery contributes to the economic vitality of the Mille Lacs Lake area through added tourism dollars. For example, B.A.S.S. recently announced its Angler of the Year tournament will travel to Mille Lacs in September of 2016. The economic impact will provide over $3.4 million to the region. This improves overall property values and maintains a robust community. Taking care of a precious natural resource is just the right thing to do. “We’ve done a lot of initial work to get organized,” said Jim DaRosa, serving as the first President of the new Alliance. “We have a board of directors in place consisting of local anglers and business owners. People are coming together to create a unified voice.” A website is now live at www.milleleacssmallmouthalliance.com with the honorary board members including: Al Lindner, Ron Lindner, Ron Schara, Mark Zona and James Lindner. In addition to DaRosa, a smallmouth guide and tournament angler, the other officers include George Liddle, Ranger/Stratos Boats manufacturer’s representative and tournament bass angler, as Vice President, and Linda Dahlen, avid outdoorswoman and Chamber board member, as Secretary/Treasurer. The remaining board members include: Justin Baldwin with Hunters Point Resort, Scott Bonnema founder of Classic Bass, Jason Holmer with Bass Utopia, Terry McQuoid with McQuoid’s Inn and Resort, Janet Parker, professional bass angler, Tony Roach of Roach’s Guide Service , Mark Schutz of Schutz Guide Service and Brian Wood, avid bass and tournament angler. All board members own homes and/or businesses in the Mille Lacs area. •	A BRONZEBACK BLOWOUT event will be the Alliance’s first fundraiser, slated for Saturday, April 23, 2016 at McQuoid’s Inn and Resort in Isle, Minnesota. Save the date. 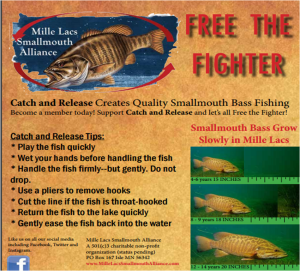 •	During the Northwest Sportshow (March 30-April 3) in Minneapolis, Minnesota, the Mille Lacs Smallmouth Alliance will have an informational booth at the show educating anglers on catch and release and accepting membership applications. “This is a very special fishery with national significance to bass anglers everywhere. It’s just incredible,” said DaRosa. “Mille Lacs needs to be protected. It may take several years [for the DNR’s work] to restore walleye to the levels they once were; we want to be proactive and make sure the smallmouth are healthy and sustainable while the walleye population is being restored.” The Alliance is not about petty, divisive politics. World-class walleye and smallmouth bass fisheries can co-exist with proper management. Mille Lacs has been consistently included in the top ten of smallmouth bass fisheries across the country. In this article by Wired2Fish, Mille Lacs ranked number four overall: www.scout.com/outdoors/wired2fish/story/1573452-2015-top-15-smallmouth-bass-lakes. Check out www.millelacssmallmouthalliance.com or email Jim DaRosa, president at info@millelacssmallmouthalliance.com. MLSA is pending final approval from the IRS for its 501c3 non-profit status. The organization was founded in October of 2015 in the State of Minnesota.